This title was first published in 2001. This is a seminal collection. 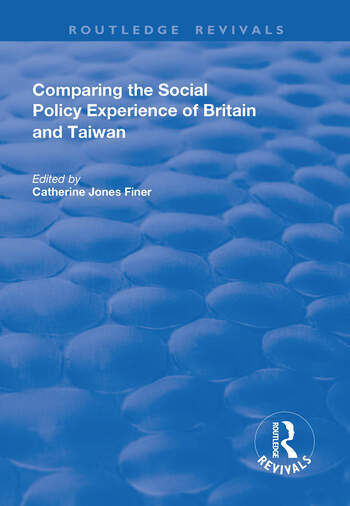 For the first time, leading scholars and practitioners from Taiwan join with counterparts from Britain to offer comparable commentary on key social policy and social service issues affecting their respective countries. The result is as thought-provoking as it is informative. The approach adopted - of encouraging writers to speak for themselves virtually without restriction - could well provide a model in itself for encouraging and easing contributions from previously unpresented countries into the mainstream of comparative cross-national social policy debate. Concluding papers, on the prospects for East-West comparative social policy in general, confirm the significance of this collection by emphasizing its contribution to broader, social and political debates. Contents: Editorial introduction, Catherine Jones Finer. Overview of Trends in Social Policy and Social Services Delivery: The development of the British welfare state, Pete Alcock; To be or not to be a Taiwanese welfare state. Lessons from recent experience, Yeun-wen Ku; Modernizing social welfare services? change and continuity in social care and social welfare in Britain, Ann Davis; The myth and the reality of privatizing social welfare services: a case study of Taipei City, Hsiao-Hung Nancy Chen. Pensions: Is it safe enough? the planning of national pensions insurance in Taiwan, Yeun-wen Ku and Hsui Hui Chen; Thinking the unthinkable? pensions policy prospects in Britain, Tony Maltby. Health Care: Financing health care for middle-to-low income households in Taiwan, George Cheng Wang; Current themes and issues in Britain’s National Health Service, Robert N. Matthews. Family and Community Care and Control: A comprehensive policy for the single-parent family, Betty Y. Weng; Family support services: some recent developments, Kate Morris; The social construction of ageing: elderly women in Taiwan, Lih-Rong Wang; Enhancing independence in old age, Nick Le Mesurier; Community care for the elderly people in Taiwan: illusion, vision or reality?, Yuan-shie Hwang; Crime, punishment and community in England and Wales, Susan Hanley and Mike Nellis. East-West Ideas on Welfare and Growth: Looking East, looking West: trends in orientalism and occidentalism amongst applied social scientists, John Doling and Catherine Jones Finer; Elite political-cultural projects, economic growth and the achievement of social welfare in East Asia, Peter W. Preston; Indices.